Christening ships is a tradition that's thousands of years old. Biking, busing, tramming or hoofing it, Amsterdam is a city easy to get around. It has beauty, charm, and hundreds of canals connected by 500 pretty bridges - and flowers everywhere! These 17th century canals enjoy the honor of having been added to the UNESCO World Heritage List in 2010 and their grassy banks are perfect paths for a romantic stroll. Recently I had the great good luck to visit Amsterdam and attend an historic launching of 10 new Viking Longships as this most award-winning line expands into a new era of European river cruising. 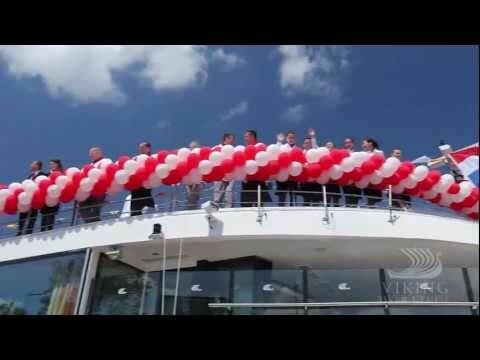 This was an auspicious occasion because, for the first time ever, a river cruise company was launching ten ships all at once – and I was there to witness it! As that wise gentleman, Mark Twain, once said, “Twenty years from now you will be more disappointed by the things you didn’t do than by the ones you did do. So throw off the bowlines and sail away from the safe harbor. Catch the trade winds in your sails. Explore. Dream. Discover.” That is precisely what happens on a Viking Longship. Although my stay aboard the Viking Aegir was brief, I nonetheless was able to debark a few times and explore parts of Amsterdam, experiencing some of its special treasures and causing me perhaps to dream? Yes, indeed I did. In Amsterdam’s medieval center, there stands the Gothic basilica Nieuwe Kerk, the coronation church for Dutch royalty. Its intricately carved oak alter was stunning and the stained-glass windows handsome despite no sun shinning through that day. I sat in a pew hoping that perhaps I’d hear some notes from the massive, gilded organ. After some 20 minutes or so, my optimism was rewarded with the thunderous peal of Bach’s organ fugue in G minor. Could there be a more perfect end to my church visit? Another outing took me to Museum Het Schip (the ship), one of the highlights of the Amsterdam School of Architecture, so called because its shape somewhat resembles a ship. Built in 1919-1921, three monumental social housing blocks designed by architect Michel de Klerk are viewed as a masterpiece and symbolize the solidarity and emancipation of the working class at the beginning of the last century. No longer were the poor condemned to live in basements and slums but now had safe, affordable housing. The Amsterdam School paid a great deal of attention to the applied arts, designing in such a versatile and expressive way that the style is often seen as the Dutch version of Art Deco. Inside, there’s a charming little post office and a floor plan that is completely decorated with furniture and objects that were available to the working class in the twenties. Remarkable is the fact that this design by famous artists and architects was to be found in these modest working class houses. At Concertgebouw, (Royal Concert Hall), opened in 1882, I attended a concert of Brahms, Chausson and Ravel with violinist Tosca Opdam and pianist Victor Stanislavsky, their music at times bold and regal, other times poignant and tender; at all times rendered gorgeously by this world-class duo. Although our ship had no plans to stray afar of the ceremonial goings-on, we did take a brief cruise down the Ijsselmeer River to Hoorn, an ancient harbor town founded in 716. This is a pretty community with monumental building facades and inviting sidewalk cafes. Sadly, no sidewalk sitting this day….waaaay too cold. However, the experience of leisurely making our water-way down the river was picturesque. Nooooo, let’s have none of that. The ceremony for the ten new Viking Longships was dignified, decorous and dazzling.